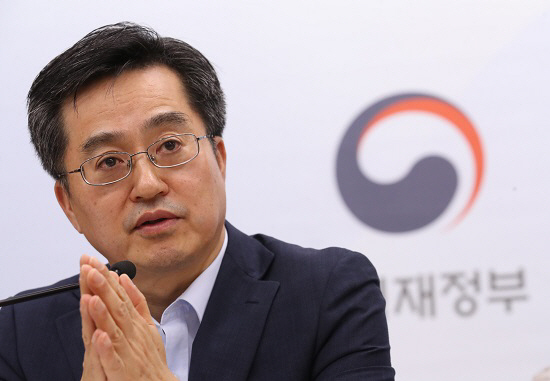 South Korea’s economy is expected to face growing economic uncertainties next year, with the government ready to take preemptive measures to reduce any possible downside risks, the country’s chief economic policymaker said Monday. “Given various factors such as external conditions, our economy may face growing uncertainties,” Finance Minister Kim Dong-yeon said in a parliamentary audit session in Seoul. The minister said the government will take measures to reduce any potential downside risks by raising fiscal spending amid rising expectations that rate hikes are in the offing. “I don’t see any chance of the economy contracting, but we have to take steps to reduce uncertainties,” he said. Last week, Kim said Asia’s fourth-largest economy may grow at a lower-than-expected pace this year due to the growing trade war between the United States and China and rising oil prices. The Finance Ministry earlier estimated that the economy would grow at a pace of 2.9 percent this year. But economic data are fueling concerns that the economy is losing upward momentum. In the third quarter of the year, the South Korean economy grew 0.6 percent on-quarter, the same as the 0.6 percent gain tallied in the second quarter and down from a 1 percent expansion in the first, according to the preliminary estimate by the Bank of Korea. From a year earlier, the country grew 2 percent over the three-month period, marking the slowest on-year growth since the third quarter of 2009. The sluggish third-quarter growth came a week after the BOK revised down its growth target for 2018 to 2.7 percent from 2.9 percent. In the first nine months of the year, the South Korean economy grew by 2.5 percent. Sluggish construction and facility investment major influences on the slowdown. The number of new jobs fell to 17,000 in the third quarter of the year, plunging from a gain of 101,000 three months earlier. For the whole of 2018, the BOK sees only 90,000 new jobs being added to the labor market, sharply down from the modest estimate made just three months earlier. The finance minister said the hike in the country’s minimum wage is having a partially negative effect on the economy, but it is the right course for the economy to follow. “It is necessary and important for the wage hike to take root in our economy, and it also needs some adjustments to send a stable message to the market,” he said. The Moon Jae-in administration increased the minimum wage for all workers by 16.4 percent this year to 7,530 won ($6.60) from 6,470 won in 2017, after setting a goal of raising hourly pay to at least 10,000 won by 2020. The government is preaching a policy of “income-driven growth” that calls for a virtuous cycle of increasing household income and spending. But the country’s job market conditions remained in the doldrums, with opponents arguing that the policy should be scrapped. Asked about the tumbling stock market, Kim said the situation hasn’t reached a point of panic. The benchmark Kospi ended at 1,996.05 points on Monday, dropping 31.10 points to a two-year low. The index was sitting at 2,161.71 points just a week ago. Kim blamed the combination of global uncertainties and economic downturn for the rapidly falling market.